It started off with a documentary I had seen—Bombies— that filled me with guilt for not knowing about what the US had done to Laos. What’s more was the fact that there was a connection with where I live and where bombies were manufactured to a place thousands of miles away where they were dropped. Suddenly my two worlds collided. Later, I had the opportunity to see Bomb Harvest, another documentary about the disposal of leftover explosives and the effects of what our country’s leaders felt was a necessary evil some 40 years ago. And here and there I am reminded of the legacies of the war through difference sources like Anthony Bourdain’s show, No Reservation, recent newspaper articles, and even meeting a victim and survivor who was left scarred with missing limbs. A little over a month ago I visited the Legacies of War headquarters in Washington, DC and met some of the board members who are highly committed to the cause and creating awareness about the effects of the unexploded bombs. It is work in which we should show support and help spread word. Our US government needs to step it up and own up to it. Just a few days ago I received a package and in it were the peace bomb bracelets I purchased. 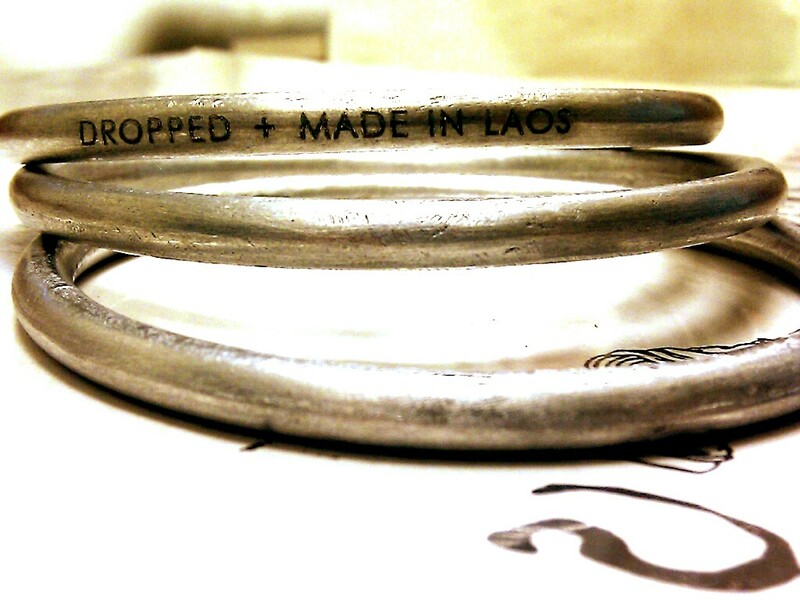 Basically, there’s an organization that is selling bracelets made from pieces of the bombs dropped in Laos. Purchasing the bracelets helps to create jobs and gives back to the artisans whose lives may have been affected. Essentially, in purchasing these bracelets I am buying back the bombs. But one thing remains, no matter how many bracelets I buy, there will always be that remnant of history that is broken and priceless.